Oceanfront 1 bedroom 1 bath Sleeps 2 Balinese Beach House across from Kehena Beach! Unwind at this very Romantic and Authentic Bali House located less than 200 ft. from the World famous “Kehena Black Sand Beach”! This Beautiful Bali Home has unobstructed Oceanfront Views of Kehena Bay, home to Spinner dolphins and Humpback whales (during the winter months). Master Ocean View suite features a private ocean view bedroom with a sliding glass door leading to a covered ocean view deck with loungers and table. Made from exotic hardwood Merbau, Cedar & Teak walls Hand carved Teak support posts and open beam teak ceiling. It is furnished with high end Tommy Bahama 4 post Cal King bedroom set with sealy posturepedic bed, Flat screen TV w/DVD & library, phone, stereo, iPhone dock, programmable Safe and more. It would be our Honor to Host you! Become part of our Ohana today! The Bali Cottage is a handcrafted custom built 2 story Cottage house that sits on a 9000 sq. ft property. Made with cedar, teak, merbau and pine woods, and imported materials from Bali, the Bali Cottage is Unique and one of a kind! Decorated with authentic Bali and Japanese antiques, which gives the Cottage it's charm and beauty. 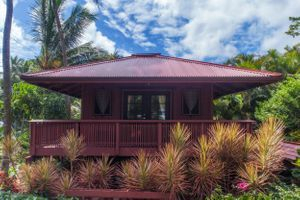 It also features an on-suite bathroom with floor to ceiling shower tile, bamboo flooring, kitchen, living and dining space below that is fully screened and covered ocean-view wraparound deck and Lanai. Nestled in the lush tropical garden is a separate covered Gazebo Private outdoor garden 2 person hot tub exclusive to our Bali Cottage guest only to enjoy! The Bali Cottage has garden chairs, hammock under coconut trees and private garden for rejuvenating and sunbathing. With privacy in mind, The Bali Cottage is it’s own house and is separated by gates from our Bali House located 50 ft away. 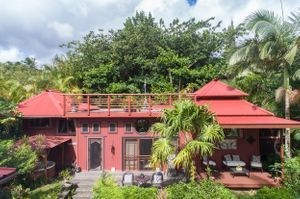 The entire property is surrounded by Lava rock walls, a wide variety of exotic palms, bamboo fencing, Iron & Bamboo Gates and covered parking. Tropical fruit trees, Pineapples and a wide variety of flowers in every corner! The Bali Cottage has hosted many Guest from all over the world has been voted most Romantic setting in Travel Magazines and Favorite places on Google! Come and stay in a part of Hawaii that is full of beauty and tradition and let us be your Host and experience our Aloha Spirit!